When Cassandra Thorburn opened up about her decision to stay at home with her children while her husband, Karl Stefanovic, pursued his glittering career, vociferous public debate ensued. Strangers took sides, with one team arguing that women should not give up their careers for fear of later regret and another team purporting that a carer’s work is undervalued and stay-at-home mothers are often stigmatized. FlexCareers co-founder, Joel McInnes, recently shared his perspective about his wife’s return to work, with sage advice for husbands. The company soon posted a raw response from a reader. Why do the subjects of returning to work, staying at home, flexible work and parental leave rankle strangers, and why does such a personal, family decision give life to such a public debate? Following are three interviews with four office-based professionals who have kindly shared their personal experiences. Sally Poulton stays home with her three young boys after deciding not to return to a stressful audit role in a Big Four accounting firm. Prior to having children, Sally worked five days a week during the ‘audit season’, often until the early hours of the morning. When she had her first son, she returned to work after seven months, two days a week. “I found working two days to be a bit more difficult, probably because I had worked my way up to a more senior position and there was an expectation that I manage people, so I was expected to be available,” said Sally. “Other staff and the partners were amazing,” she said. “I would flip my days all the time trying to find something that worked better for me. Sally said that while the company tried their best, she found it difficult. “I felt like I wasn’t doing my job properly and I felt like I wasn’t looking after my kids properly,” she said. Like many people adjusting to life with children, there is much guilt and uncertainty about what the best decision is for the individual and the family. Add to this the monumental shift in one’s identity, it makes the decision all the more complex and emotional. “Since I had worked so hard to do my CA (to become a Chartered Accountant) and build up this career, I’ve found it really difficult to let go of the fact that I’m a chartered accountant,” Sally said. “It took me a long time to be proud of the fact that it’s not a bad thing to be at home with the babies. “I’ve worked part-time with children, I’ve worked at home with children, I’ve been at home full time with children (and) no matter what you do, it’s hard for everybody. Daniel McDonald* formerly worked in a FIFO role while his wife, Sarah*, works in a high-pressure, global mining role. After some time, the challenge proved too much with Daniel taking a city-based role and a pay cut to be close to his family. “We knew it wasn’t working and from my perspective I was becoming a bit of a crazy woman,” Sarah said. Central to making this dual career family hum is an even split of domestic and childrearing responsibilities, a lot of planning and juggling, and, fortunately, some support from grandparents and a casual nanny. “We do a lot of pre-planning for meals and around schedules because at the moment a lot of Sarah’s work is not 9 to 5,” said Daniel. “Most days Sarah will drop the kids at daycare and I will go off to work at about 7 a.m. until about 4:30 to 5 p.m. to pick up the kids. “A lot of nights Sarah will have a work call for a couple of hours and before that she can go to the gym while I get everyone ready, making sure the lunches are packed for the next day. Sarah has about three evening conference calls each week. “When I first went back to work I always felt this pressure that I had to be there at 8 in the morning until 5 p.m. and then back on the conference calls at 7:30 p.m.,” she said. While Daniel’s work has been wholly supportive of his flexible approach, Sarah admits to hearing the odd, negative comment from colleagues. As an example, Sarah said on one evening phone call she picked up “a teleconference, forgetting to press mute” all the while yelling at her four year old to get into bed. She recalls hearing someone say ‘oh, that’s Sarah on the line’. Peter Livesey, Regional Facilities Manager – Asia Pacific and North America for Travelex, appreciates the importance of the mute button when working from home. “Working from home can prove challenging at times, particularly with a young family,” Peter said. “There was one time I needed to be on an important one to one call with one of the executives and my wife was away at the time, then just as I dialed in my young son trapped his finger in the door. Peter’s flexible work arrangement, with two days working from home, suits the business as it frees up desks in the CBD office (with more employees than dedicated work stations) and enables him to communicate with global colleagues during their business hours, instead of trying to get to the office at 5 or 6 a.m. Both Peter and his wife Christina have enjoyed successful careers with roles that permit some flexibility. “We both have regular calls at set times which we are both aware of and we generally discuss what our “out of hours” working week looks like,” he said. Broaching the topic of flexible work with one’s manager can be tricky, and while increasing numbers of men are working flexibly, research suggests men are more likely to face adverse reactions and up to twice as likely to have the request rejected. “When I first started working from home, I felt incredibly uncomfortable with the whole notion of not being at a place of work,” Peter said. “It was like I was cheating on the business and my fellow colleagues would ridicule me about it. “But I have absolutely got over this and now manage my set tasks differently to suit,” he said. Peter said that with flexibility comes personal responsibility and trust from his employer and he notes that flexible work is not possible for every role. “Depending on your role in the company, Travelex supports Working From Home and the flexibility required to do this,” he said. As flexible work is normalised for both men and women – parents or not – and employers routinely value people for their performance and not time spent in the office, more people can achieve the ‘work-life balance’ that’s right for them. *Daniel and Sarah requested that their actual names not be revealed. Ron Freeman is an Olympic Gold Medallist, an Olympic Bronze Medallist, a civil rights champion, an advocate for education and for the empowerment of women. He earned a degree in Political Science and a Masters in Student Personnel. His participation in one of the most memorable moments of an Olympics Games – in a black beret and arm raised – secured his place in civil rights history. Yet the sum of all of these accolades and achievements do not do Ron justice. Ron left the USA in 2006 to reside in Conakry, the Republic of Guinea, where Ron leads the International Medalist Association, an organisation that is the culmination of a vision Ron shared with his 400m track team members, Lee Evans and Larry James. Ron started the International Medalist Association to focus on inner-city initiatives in Baltimore and has transformed it into an International Organisation benefiting youth in the USA and Africa. It is in Guinea where I had the good fortune to meet Ron and learn a bit about his life and his passion. Ron kindly agreed to be interviewed for UNYARN. During your life you have been an advocate for change, famously at the 1968 Olympics and also through your work in Guinea. What change have you witnessed as a result of your, and other people’s, efforts? President Obama being elected at the first Black President of the United States and development of After School Educational programs in schools around the United State. I was fortunate to start the first After School Program in the City of Elizabeth, N.J in the late 70’s that is still active. These programs has given a body of students the opportunity to gain much needed educational support around the United States and we hope to initiate a similar program in Guinea. The election of America’s first President of African decent came after year’s of struggles though the Civil Rights period which we saw many great leaders make the ultimate commitment along with men, women and children of ALL colors and races. After more than fifty years of being under Military Rule the people of Guinea brought Guinea into the 21st Century In becoming a Democratic Country by hosting peaceful Democratic Elections. I am both happy and proud to have had to opportunity to see these great events happen in my lifetime. 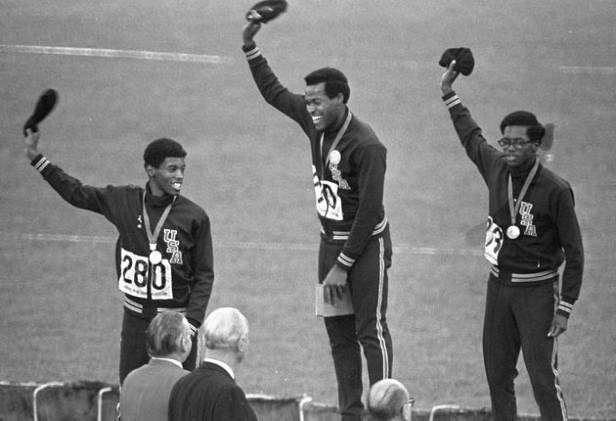 At the 1968 Olympics, you and other athletes took a stand for equality. Describe the lead up to the Olympics and the feeling of change, not only within the Olympic team but also more generally. The Civil Rights period was a time when we as athletes had to do our part in bringing attention to the uneven justice that was brought upon Americans of African decent for many area’s of our lives. Education, health, housing, employment were a few of the areas of concern. There were several meetings amongst the Olympic Athletes prior to the team selection and after teams were selected. There was an organization set up in San Jose California named Olympic Project for Human Rights and that group suggested the idea of such as Olympic Boycott and Protest on Victory Stand. It was voted on at a meeting in Mexico City that we would use the Victory Stand to make a statement and some wore black socks and berets, others wore their pants legs up and others wore black gloves with raised fist. All of the statements were to say that Human Rights needed to be addressed in the United States. Then your team, amongst other athletes competing at the Games, took a stand for equality for African Americans. Describe your podium experience and the reaction of the International Olympic Committee, the US Olympic Committee and team, and people back home in the US. My victory stand experience was bitter sweet. Bitter because a few days before my two friends John and Tommy were asked to leave the Olympic Village and sent back to the U.S because of a choice that they made in support of Human Rights. Also, that the day before our open race, Lee, Larry and I were scolded and Warned TO BE CAREFULL WHAT WE SAY OR DO ON THE VICTORY STAND, BECAUSE WE WOULD LOSE OUR RIGHT TO RUN AGAIN AND THAT WOULD ALSO IMPACT ON OUR UNIVERSITY SCHOLARSHIPS. Can you imagine having that type of pressure put on you before the biggest race of your life? The President of the International Olympic Committee A.B told us that and he wasn’t joking. No one from the USOC mentioned anything to me, but I must say that my parents that were at the event did make a strong request to me at the time. I did receive hundreds of western Union telegrams from residents of my hometown in support of my making the team and wishing me the best. You blitzed the relay leg with the fastest ever leg of the 4x 400m relay; a record you held for 25 years. What is your most vivid memory from the event? Being ranked number one in the world leading up to the Games, our goal was to smash the world record and set it at 2:55.00. We calculated the time that we were going to run, with the world record being 3:00. We even made up a song and started singing it:” 2:55 and that aint no jive”. 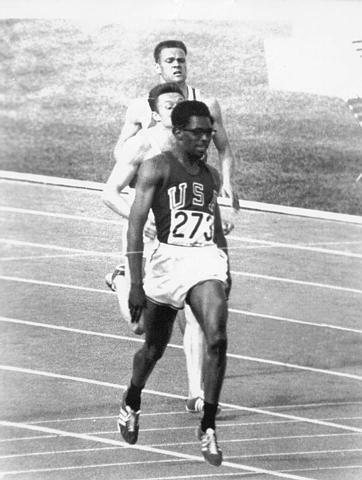 While we used a sprint relay pass for the 4×400 meter relay, to date that has NEVER been done since 1968. (4×100 meter relay exchanges the stick up and all other relays exchanges the stick over and down) The degree of difficulty is greater when using the sprint on the 4×400 relay because you MUST come in at a faster speed. I remember being ten meters behind a Kenyan runner when I received the baton, which was a long distance behind in this relay and particularly at the Olympic games. I realized if we were going to smash the world record that I would have to begin my kick with three hundred meters to make up for lost ground and that’s what I did, running the faster relay leg ever, in the history of the Olympic Games, 43.2. You now run the International Medalist Association; a standout organisation. How did IMA come into being? And tell me a little about what IMA does. I started I.M.A in 1998. It was the vision of Larry James, Lee Evans and I to develop an organization that could impact on youth around the world. In 1999, with the support of Dan & Sandy Krivit, Nokware Adesegun and Eunice Carol Miles and an active Board of Directors, the International Medalist Association became that International Organization. The International Medalist Association is focused on Education as we specialize in After School Educational Services, which supports primary & secondary schools in Maryland, USA. We raise funds to help schools in poor area’s of the U.S and developing Countries give services to their students that other wise may not be possible i.e. : University Tours, Tutors from University Students from John’s Hopkins University & Morgan State University in Baltimore Maryland, USA. In many cases (60%) our students are raised by their Grandparents and are poor. For more than ten years we have been feeding 100 students per day a hot meal for dinner along with other supportive services in the United States. We also host a FREE six-week summer camp in Math, Science and sports for our students. Since 1999 we have also been helping developing countries enhance their sports programs by training entry-level coaches in Athletics & Basketball, with the support of Olympians from the United States. In Guinea and other developing countries, our mission is the same regarding supporting education, but we also focus on Empowering Girls, promoting Leadership & Democracy, implementing RECREATIONAL activities because there is little RECREATIONAL activities for the youth. One activity that we are promoting not only in Guinea but also through West Africa is the game of Double Dutch or Jump rope. This creates fitness for girls, teamwork and gives girls something that they can do anytime, anywhere. We are raising funds to buy jump ropes and sneakers for girls and our goal is to put a single rope in every girl’s hand. Most recently employees of Guinea Alumina Corporation donated hundreds of ropes and sneakers to girls of Conakry, Guinea, which was amazing. We are also raising funds for Books so that students can have the opportunity to read. While we work directly with 17 schools, so far we have given $5000.00 worth of new books and jump ropes to 13 of our schools this year and we hope to have a greater impact and offer service to more schools as the funding develops. Why did you choose Guinea? After many years of doing work in Guinea on behalf of the United States Department of State and having the opportunity to Develop the largest Multi Country Youth Peace Initiative in Guinea (Sierra Leone, Liberia & Cote D Ivoire) for UNDP and during that time I had the opportunity to grow closer to residents of Guinea and learned so much about the loving culture. I saw the potential of Guinea some years ago as the people are loving, caring and sharing people, who have made a sacrifice by excepting more than 700,000 refugees from surrounding countries without any mishap. As an American of African decent I found a personal connection, feeling and caring, as my decedents could have been Guinean. The first African that I met at 21 years old was a Guinean at the 68 Olympic games and he was the Head Coach of the football team and now he is the President of the National Olympic Committee and we are great friends today. Lastly, Guinea is a beautiful country and one of the most peaceful countries I have ever been to in my life and I love Guinea. As someone who inspires others, who is the person who most inspires you? Many people have come into my life at various times to inspire me. God, family, coaches, teachers, and co-workers are just a few. Thank you Ron. Congratulations on your incredible success & I wish you all the best for many more successes, and of course, health and happiness. Visit Youtube to view Ron’s 4 x 400 m race and his 400 m individual race. Ron’s concern about youth combatants, child slavery and the lack of educational initiatives in Africa has led him to become heavily involved with various partners who share his mission-to eradicate these detrimental areas in this African region. The United Nations, U.S Department of State, U.S Department of Education, U.S Department of Labor,UNDP, UNESCO,USOC, UNICEF and World Health Organization (WHO) are key partners who have supported IMA throughout the years. Ron, through his work in the IMA, has been instrumental in bringing doctors to African countries to provide free eye exams, operations and eye glasses for people of all ages. In addition, Ron has supported bringing Africans to the USA for internships at universities. Ron recently received the Distinguished Alumni Award from his alma mater, Kean University, and was inducted into several Halls of Fame, and in 2007, became the first American to receive the Jappo HUMANITARIUM AWARD in Dakar, Senegal, for his work in Africa through IMA. Australia’s Indigenous people have inhabited this land for tens of thousands of years. Some say as long as 65,000 years, making it the oldest living cultural history in the world. 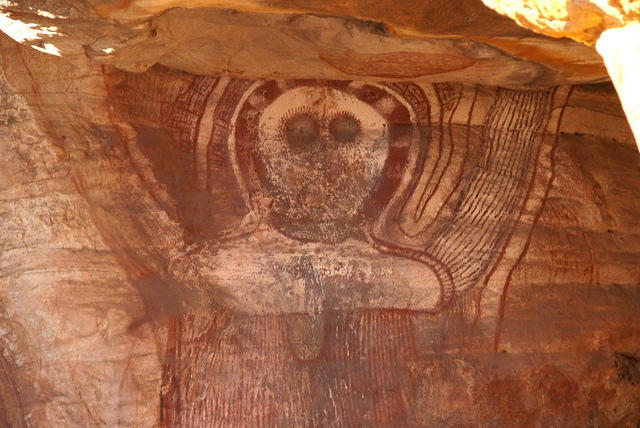 This morning I saw Google’s Art Project and browsing through this, I came upon Rock Art. Long before the First Fleet set foot in Australia, Aborigines saw many seafaring folk sailing by and recorded this, amongst most every other detail of life, through rock art. Below is an extract from an article written by Kathy Marks in the Independent in 2008. “It also appears to rewrite Australian history, undermining the widely held assumption that the continent was isolated and largely unvisited until the First Fleet arrived in 1788. The paintings suggest that, on the contrary, the people of northern Australia have been interacting with seafaring visitors from Asia and Europe for hundreds, possibly thousands, of years. A team of scientists on a recent expedition to the Wellington Range recorded 81 images of ships, ranging from the vessels of Macassan traders from Sulawesi (now part of Indonesia) to dugout canoes, 19th-century British tall ships, 20th-century steamers and Japanese pearling luggers. They even found paintings of a luxury cruise ship and a Second World War destroyer. Thanks to John Benwell for the photo. When your mother was pregnant with you, I wonder what she envisaged. Would she have seen a future for you that is miles apart from where you are now? Would she have minded, in any case? Would she have thought, ‘this thing, this child that grows inside of me, will consume my entire future’? Would she have expected you to face a nuclear war? Was terrorism on her radar? Was global warming a concern as she and her fellow baby boomers led the charge toward consumerism? I certainly don’t want to favour women over men, so replace your mother with your father (albeit probably not pregnant with you in his womb). Today, what do you envisage for your children or future children? What will be the challenges they face? This article by Catherine Armitage in Fairfax media presents a perspective on the possible life of baby Mia, a newborn. It looks at the likely future population, the evolution of our education system, and credit and debit chips implanted into hands. It highlights tomorrow’s prevalent diseases, and the work that will sustain our population. It’s an interesting read. Graeme’s photographs of today bear little resemblance to the violence he once photographed. However there is still the despair and the contrast between the haves and the have-nots. Most recently Graeme returned to some of the locations where he once took photographs during that tumultuous period. Some locations present stark changes, while others are frighteningly similar. Graeme describes looking for a house, which was in one of his photographs, taken about 18 years earlier. A woman stands in front of the house. In his search to rediscover the location , he stopped to inquire with a man. “I just started chatting with him and I showed him this photograph and I said ‘I’ve been looking for this house’. “And he says ‘I know that woman’.” After determining that Graeme was not the police, nor conducting his search for any untoward reason, the man took Graeme to the house. His photographs in this latest series are presented alongside the old photographs – a kind of ‘then and now’ perspective. His other photographs from that period of violence in the 90’s, he says, show up from time to time, sometimes in places most unexpected. In 2008, as Barack Obama sought Presidency and raced for the position against John McCain, Newsweek magazine ran a story with two photographs that best represented the candidates. Graeme’s iconic photograph (pictured in the gallery) of children skylarking in front of a fence, where just beyond, gun-toting police sit watching an ANC rally, was selected as the photo to represent Barack Obama. Graeme shies away from acknowledging the significance of this tale. “It was in the lead up to the election and Newsweek did a piece on him and John McCain and they chose one photograph each to represent each person. He wasn’t foretold of this inclusion in the magazine, he says. When I first had the pleasure of meeting Graeme in the Republic of Guinea in 2011, he told me on our final day travelling together that at that moment, an exhibition of his work was being held at London’s Victoria and Albert Museum. No small feat for any artist. And that is just what his work has become – art. Graeme has shifted from a young man who fearlessly and famously secured photographs that enlightened the world to the plight of South Africa, to a more contemplative artist. His photographs communicate his feelings and moods about a subject, rather than the direct documentary style of the past. Yet they are still largely of South Africa, demonstrating his unwavering passion, and they still paint a poignant story for the world to see. Photographs in this gallery demonstrate Graeme’s newer works, with the exception of the Newsweek-selected photograph of the ANC rally. The decision to leave behind the hard news photojournalism that Graeme had thrived on was essentially made for him. He tells of the day he photographed a woman being shot, and found himself on the unfriendly end of a shotgun. “The right wing was attempting to begin a coup in this particular apartheid homeland (apartheid era term for a segregated area). “At some point, there was this right wing group, the AWB, and they were driving in convoy and they should have gone out of town and turned right at this T-junction but they arrogantly turned left to go through the town again. It was a big event in the time. “They drove into town and three white AWB guys were killed by soldiers from this homeland. Then things just went ballistic. “This one AWB guy was a middle aged, well-dressed deacon of the church-type chap, with his hunting rifle. “(He) was shooting a woman as she ran in between houses and I was photographing him do it and as I did it, these young AWB guys saw me and went for me. “So I put my cameras down and then they beat me up a bit and then one put a shotgun in my mouth. While saved from the grip of imminent death, the incident had a lasting impact on Graeme and while he got up and walked away, he was soon felled. “A week after that event I was covering something in another part of the country and it hit me, literally like a brick wall,” he says. “I couldn’t actually do anything. I checked into a hotel and slept for, like, 20 hours. “Then it was gone. I still did some news, but I was always aware of my own vulnerability so you can’t actually do that work if you carry that knowledge around with you all the time. “I knew it was time to get out because I was a danger to myself actually. “You are operating at a pretty low consciousness level while covering violence. It’s all pretty primal stuff. You can’t survive by just relying on one’s intellect. Graeme says it was a deliberate, yet difficult, decision to stop. Instead he stayed at home and watched it on television. “I never did news again,” he says. And tellingly, it took another five years before Graeme felt that he could integrate with normal society once again. South African Graeme Williams – white skinned, if that makes this story any more complete – was brought up to believe that the apartheid regime was fundamentally unjust. So when the opportunity arose to photograph Nelson Mandela walking free from prison after 27 years of incarceration, one can only imagine Graeme’s breathless anticipation. “It was all very secretive so we didn’t know it was going to happen, because the apartheid government didn’t want to get everyone worked up into a frenzy before he was released,” he says. Reuters sent Graeme to Cape Town about two days before the release from prison, on a hunch that it might happen. “I got a call at eight o’clock one night from the government liaison saying that there was a photograph of Mandela (the first sighted in some 20 years) ready to be collected, and I screamed down to the government buildings to collect this photograph, and it was just amazing. “You just knew. You could almost feel the whole country’s expectations, and also fear. Because, you know, with a change in the country you almost felt like, what is going to happen? Is it all going to work or fall apart? But you knew it was the start of something really big. He speaks of the process agreed between the Reuters photographers covering the event. The chief photographer, with a “lens the size of a cricket bat”, would cover the first three steps and Graeme was to cover the next three. “We had been standing outside Victor Vester’s prison gate. We got there probably about 8:30 in the morning and he probably came out at 3 or 4 in the afternoon,” he says. The scenes around the photographers were chaotic, with crowds pushing forward and the hot sun causing exhaustion. All of this must have been forgotten in a split second however, as the television helicopters which had been circling above, suddenly turned on their heads. “It was this rush of adrenaline that makes your hair stand on end, and you just felt, ok he’s coming, he’s coming. And you notice after seven or eight hours of standing there that you are only going to get a minute or so to pull this picture off. “So it’s exciting but the pressure was absolutely huge. And these helicopters were following slowly, slowly, slowly, and they came closer, closer and closer to the gate. “And he got out, walked through the gates with Winnie and it was just like… electrifying is the only word. It was just amazing. “We were just going click click, click click. And then the crowd pushed forward and the whole thing was over. “So I don’t know how many seconds or minutes it lasted for… then Mandela was pushed into a car and sped away. The excitement was not quelled; rather, after sending off the photograph of Mandela to Reuters, the photographers attended his speech at the Cape Town City Hall. “It was this bizarre situation because you had this amazing moment of him talking and then there was a battle going on between the police and ANC youth, not 200 metres away… it was completely wild. That night, Nelson Mandela stayed at the home of Archbishop Desmond Tutu. The following morning Graeme attended a photo opportunity at “the Arch’s” home. He tells of the uninhibited access to both men, poles apart from today’s world where you would be fenced off and at best would have a far-off view of the action. Graeme describes the access as “remarkable”. “Mandela would wander in, come shake your hand and say hi. We would say ‘we think that it will be best to sit over there for the portrait. The casualness of the encounter was made all the more exceptional by Mandela’s kind and welcoming presence. “He was amazing from day one; everyone melted with Mandela about, because he interacted on such a personal level with everyone,” he says. “There was no sense of ‘I’m great and you are just a photographer or just an ordinary person’. When he smiled at you and looked at you there was a real warmth and generosity. You really felt he was someone different, just from the way he treated people. “He genuinely enjoyed people around him. Graeme felt that finally South Africa was on the precipice of something extraordinary, and “things could really be great in South Africa, and they actually were during Mandela’s time. Graeme’s descriptions of Mandela and Tutu contrast, but are fundamentally aligned, and he has the greatest respect for both. Rather than what sounds like the kind and calm of Mandela, Archbishop Tutu was less subtle and “would come out with whatever struck him as unjust”. “Tutu is clearly a deeply religious man, but at no time did I feel he was placing himself on a pedestal and saying, ‘I’ve got it all right’. He was just someone who had moved into the forefront of the anti-apartheid struggle because he was there and more importantly because of who he was. He took up the challenge really to be a voice against apartheid and since then, a voice against any kind of injustice. In contrast to the welcoming presence of Mandela, and Archbishop Tutu, a “breath of fresh air”, Graeme photographed President Jacob Zuma in 2009. When I asked what Zuma was like, Graeme jokes, “he listened when I told him what to do and where to look. “The preamble to that was that Time Magazine had taken three months to secure this time with Zuma – one hour – and we had flown down to Durban (the journalist and Graeme). Graeme was fortunate. The reporter for Time Magazine was less so, having to wait one more week for the interview. “I had to set everything up because Time Magazine wanted at least three different pictures of different background and appeal. Gone are the days of old. No casual banter, no informality. Just 10 minutes alone, if you are lucky.